Judge Brett Kavanaugh is unfit to serve on the Supreme Court. His track record of anti-reproductive rights extremism seriously puts our constitutional right to abortion at risk — and we won't stand by. Send a message to your senators and demand they reject Kavanaugh's nomination and any nominee who will threaten our reproductive rights. I'm one of the nearly 70 percent of Americans who believe that Roe v. Wade should be upheld and that our constitutional right to abortion should be protected in this country. Kavanaugh's nomination to the Supreme Court would put that right gravely at risk. Trump has pledged to only nominate justices who he said would "automatically" overturn Roe V. Wade, and Kavanaugh meets that test. 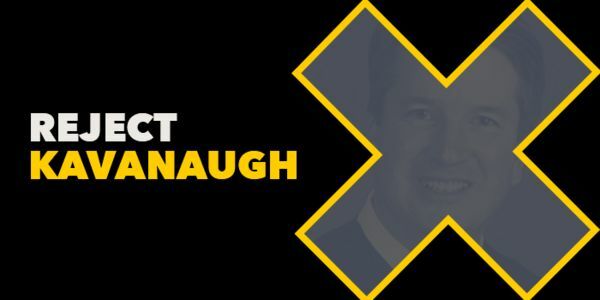 He has a dangerous track record of using the law to push extreme views that would tip the balance of the Supreme Court against our basic freedoms. We simply can't afford to go backwards on our hard-fought civil rights victories. The Senate must reject Kavanaugh's nomination and any other nominee who will threaten our constitutional right to abortion.